Didcot’s 14xx class 0-4-2 tank engine No 1466 left us on Monday 3rd December for contract overhaul at Western Steam Engineering, operated by Ed Freeman, a former volunteer at Didcot. We aim to complete the overhaul in time for the Great Western Society’s 60th anniversary in 2021. 1466 was the first locomotive purchased by the fledgling Great Western Society and indeed the reason why the Society was originally formed. The photograph shows the ramp being constructed for 1466 to be towed onto the road transporter. 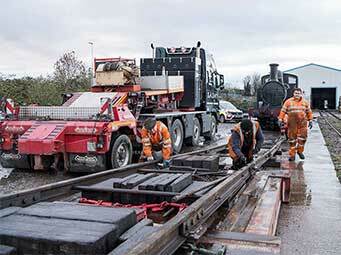 The loco had been moved from the railway centre to Didcot west yard earlier in the day. John Antell on the left and Alex Beasley on right are tightening bolts on the rails whilst Gareth Buscombe is walking towards the camera. The loco was transported to Lydney on the Dean Forest Railway, where Western Steam Engineering is located. The loco arrived safely on Tuesday 4th December. The cost of the overhaul is estimated at around £300,000, of which £190,000 is currently in the fund. The shortfall of £110,000 is to be raised over the duration of the overhaul. If you would like to contribute please send a cheque made out to the ‘Great Western Society 1466 Fund’ to Richard Croucher at Didcot Railway Centre, Didcot, OX11 7NJ. f you are also able to Gift Aid the amount, please complete and return the Gift Aid Declaration (102kb .pdf file) with your donation.